When you have many photos in your photo galleries, it can be hard to find a particular photo that your customer is after. 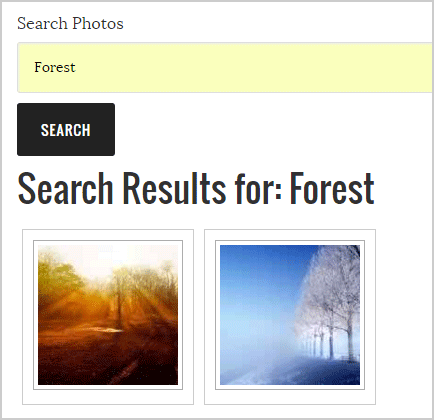 WP Photo Seller plugin offers a search option for your customers to look up images using a keyword. You can add the search functionality inside each gallery or create a separate search page for your customers to search your photos. Step 1) To create a photo search page, go to “Pages” menu from the WordPress Dashboard and click “Add New” link. Step 2) Change the page content mode to “Text” by clicking on the Text tab. Step 3) Enter a “Title” for the new page and add the following shortcode inside the page content box. Step 4) Publish the page. This new page can now be used by your customers to search images in your galleries. You can specify gallery IDs in the search shortcode to tell it to search particular galleries only. Below are some examples showing you how to use this. If you don’t want to create a separate search page then you can use the search shortcode inside the gallery page that the plugin creates for your image galleries. When you create a Photo gallery with WP Photo Seller, the plugin creates a child page with the gallery name for each gallery under the Photo Gallery page. To add the Search Photo functionality to the Photo gallery, go to the “Pages” menu from the WordPress dashboard. In “All Pages” you will find all your Photo galleries under the Photo Gallery page. Edit the Gallery page that you want to add the Search functionality to and open the page content box in Text mode by clicking the text tab. If you go to the photo gallery now through your website, you will see the search box appearing inside the gallery page. How Does the Photo Search Work? The photo seller search functionality will search all galleries/photos which are part of the photo seller system. The photo seller plugin initially reads any EXIF data from the photo file during upload time and it will use that (if available) as part of its search too. If you want to manually add more keywords to a photo, simply go to the gallery settings for a particular gallery and scroll down to the photo list and click the edit link for a photo. That will take you to the photo edit window and you can add captions, descriptions etc. We have also added the extra capability of being able to read the IPTC keyword data from an image file.